Majestic Standard Cream Couch Covers. A standard stretch soft toweling couch cover. To fit therapy couches size 24”- 30” Width and 72” Length. 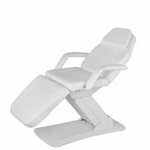 Direct Salon Supplies Laura Hydraulic Beauty Couch, white upholstered hydraulic locking beauty couch with adjustable head rest and foot rest, comfortable seat with face hole and removable headrest. Dimensions width 60cm, depth 185cm and height 60cm to 77cm. 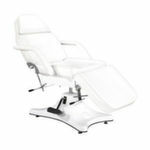 Direct Salon Supplies 1 Motor Beauty Salon Couch, modern looking two section salon couch with one height adjustable motor, adjustable manual back rest. Solid metal frame with a drop unit at the back of the bed that can lock the door wheels and unlock them if the bed needs to be moved around the room. Available in white upholstery or black upholstery. Dimensions length 185cm, width 72cm, height 60-78cm. Direct salon Supplies Delta Beauty Spa Couch, 2-section fixed bed in dark wood finish, large storage platform under the bed. The backrest is manually adjustable. 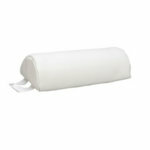 Easy-to-clean white colour PVC upholstery also includes a roll holder. Dimensions Length 190cm, Width 70cm, Height 75cm. REM Excel Standard Electric White Beauty Couch, an electric scissor lift 2 piece beauty couch with height adjustable with hand control, adjustable backrest with removable face hole and locking wheels. Available in White Upholstery. Dimensions width 68cm, height 65-91cm, length 184cm. Working maximum weight when using for massage 20 stone only. an electric scissor lift 2 piece beauty couch with height adjustable with hand control, adjustable backrest with removable face hole and locking wheels. Available in any coloured upholstery from the Rem Fabric range(Please use the drop down box to choose your colour). REM Excel 3 Motor Electric Beauty Couch with face hole. 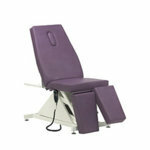 The Excel 3 Motor electric couch is a 3 piece couch with motorised movement up and down, leg-rest and head section. Removable pillow/plug and with removable arms. Excel 3 Motor is available in White only. Sizes: Width with arms 84cm, Width without arms 70cm Height 59-85cm, Length 186cm. 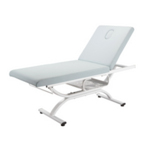 a fully motorised treatment couch which is sumptuously upholstered and with multi motor for adjusting height, back and leg rest adjustment, available in a choice of laminate and fabric colours. Other features include towel warmer storage with socket facility, towel shelf with feature LED lighting and a multi motor for height, back and legrest adjustment. Dimensions length 206cm, width 83cm, height 70cm to 101cm. 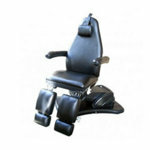 The Ambassador Make Up Chair from Rem is a hydraulic chair with a reclining back and adjustable headrest. Sizes width 65cm, height 56-66cm, depth 100cm. 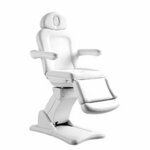 Direct Salon Supplies Beauty Chair to Couch Bed, ergonomically designed, adjusts from chair to bed and has detachable arms, available in all White or all Black. Sturdy rugged design, this couch comes with breathing hole and includes a pillow bung and drawer section. It will adjust from a chair to flat couch by manually adjusting the top and bottom sections. Sizes Approx: Width 62 cm(24"), Length 183cm(72") and Height 76cm(30"). Direct Salon Supplies Static Beauty Couch, ideal couch for massage and facials with adjustable head rest, high weight tolerance, cushion and breather hole and under bed storage. Made from easy to clean PVC. Dimensions Length 183cm, Width 65cm, Height 68cm. Direct Salon Supplies 1 Motor Electric Couch, Electric beauty couch with up and down action and gas lift back rest with pillow and breather hole. Available in White or Black(Please use the drop down box to choose your colour). Dimensions length 183cm, width 68cm and height 54cm to 88cm. Direct Salon Supplies 3 Motor 3 Section Couch, a great 3 section beauty couch with three motors with movement up and down, leg-rest and head section. Comes with face hole and pillow insert cushion and removable arms. Dimensions width with arms 85cm, width without arms 70cm, height 59-85cm and length 188cm. 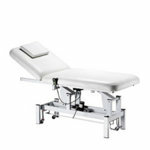 Direct Salon Supplies 2 Motor Spa Couch, wood effect base with electric height and electric head section with all white upholstery. 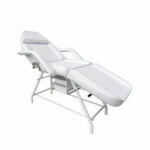 Direct Salon Supplies Ultimate 3 Motor Spa Couch, a Spa Couch with 3 electric motors making the Ultimate Spa Couch a deluxe treatment table, with its electric back rest, knee bend and height functions, all with smooth electric operation helps make it look elegant and fashionable in the spa. Comes with wood effect base, face & hole cushion, couch roll holder. Its structure brings good stability and performance. Dimensions length 192cm, width 76cm and height 64-89cm. 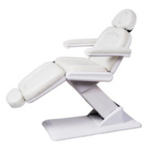 Direct Salon Supplies Luxury 3 Motor Spa Couch, a great looking spa treatment couch with 3 motors which automatically control all movements, height, backrest, and knee bend, with double arm supporting design which are detachable, headrest with breather hole and extra postural cushion. 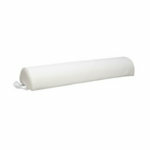 Suitable for Spas, Salons and Physiotherapists. Complete with a sturdy base with wheels to facilitate easy movement in room, luxury white PU upholstery of high quality and high density padding. 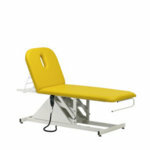 Dimensions length 199cm, width without arms 76cm, width with arms 96cm and height 56-88cm. Max weight up to 40 stone. 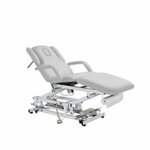 Direct Salon Supplies 3 Motor Ultimate Couch With Split Leg, fully electric clinic couch which has the added function of the seat being able to rotate 240° and with 3 motors to adjust the height, backrest and tilt. The legs move independently up and down, and also to the sides. 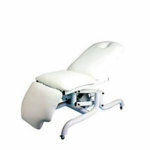 The electric podiatry couch headrest with facial hole is extendable and fully removable. This 3 motor clinic couch comes with a wireless control. This allows you to operate the couch from anywhere in the room and eliminates the need to cover trailing wires. It comes in soft touch PU upholstery which is non-absorbent so very easy to keep clean. Comes in full black finish as standard. 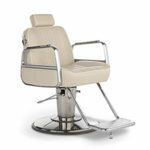 Direct Salon Supplies Tempo Lux 4 Motor Beauty Couch, modern upmarket electric chair, a very stable structure and high customer comfort, specially designed to optimize the work space thanks to its 240 degree rotation, fitted with reclining armrests and adjustable headrest, couch is controlled by 4 motors that allow a motorised adjustment of the height and different couch positions. The Tempo is covered in a white PU upholstery of high quality that makes cleaning the chair that bit easier. 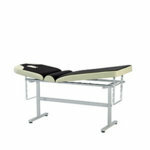 Dimensions without armrest length 186-210cm, width 58cm, height 58-89cm. 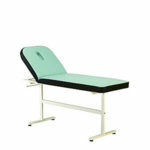 Dimensions with armrest length 186-210cm, width 72cm, height 58-89cm. 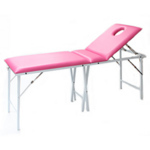 Direct Salon Supplies Tensor Beauty Spa Couch, luxury four motor spa bed which adjusts height, backrest, footrest and the whole bed inclination, great for special spa treatments. Available in white upholstery and brown or grey base. Dimensions length 185cm, width 76cm, height 68-89cm. 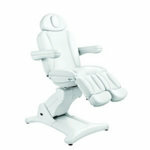 Direct Salon Supplies Tarse Lux 3 Motor Beauty Couch, modern upmarket electric chair with split leg, a very stable structure and high customer comfort, specially designed to optimize the work space thanks to its 240 degree rotation, fitted with reclining armrests and adjustable headrest, couch is controlled by 3 motors that allow a motorised adjustment of the height and couch positions, the leg rest are adjusted on gas lifts. The material is made with a white PU upholstery of high quality that makes cleaning the chair that bit easier. 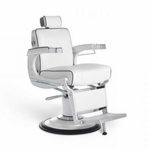 Takara Belmont Apollo 2 Elite Beauty Chair, the original classic Belmont Chair is comfortable, strong and reliable, with its cast metal body and wooden framed sprung seat with durable hydraulic base, reclining backrest and adjustable headrest. Includes hook and gown rail. Metal work available in a choice of colours gloss white, gloss black and matt black this is available on the hydraulic bases as well to match, available with black upholstery with white piping or white upholstery with black piping or all white or all black(Please use the drop down box to choose your base and upholstery colour). Takara Belmomt Cadilla Unisex Chair, a multi-funtion beauty salon or spa reclining chair with a stylish, innovative and contemporary design, strong and sturdy chair incorporates a reclining backrest, soft upholstered arm pads, a chrome of hydraulic bases, footrest with stopper, headrest and a comfy padded sprung seat offering maximum comfort and support for your customers. It is perfect for all beauty services and can be paired with any shampoo basin. Available in a full range of colours, please ring the office on 01270630280 for details. Dimensions: Height 860mm, Width 575mm, Depth 980mm, initial seat height 520mm. Black upholstery available from stock(please ring 01270 630280 for details). the Maccow is impressively refined unisex chair for a discerning taste, epitomised by how the upholstered armrests adorn one of the sexiest profiles of any back wash chair. A determinedly sturdy design lead by the ergonomics of the best styling conditions and Takara’s prime endeavor for client comfort. See it with a broad-mind and realise that it is as ideal for back wash units and beauty treatments in any beauty salons and spas. Dimensions height 850mm, width 580mm. Made to order in Japan(Please ring 01270 630280 for details). 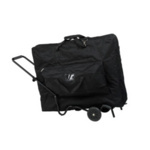 Folding trolley to be used to transport any portable beauty couch. Sturdy base with durable wheels. Ideal for mobile beauticians. 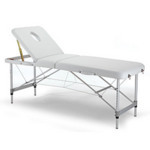 SK Flat Pack Heavy Duty Treatment Couch, couch made with a steel frame which is finished in high gloss white and flame retardant upholstery, fitted with a strong height–adjustable steel ladder back support for stability and to provide your clients with maximum comfort, comes with towel rail and face hole feature for performing massage treatments. Please note cushion not included. Optional extras available on this couch, face plug, extra width 66cm, extra height 81cm, 2 colour upholstery please ring 01270 630280 for more details. 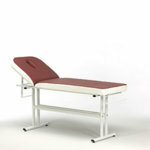 SK Flat Pack Heavy Duty Treatment Couch With Storage Rack, couch made with a steel frame which is finished in high gloss white and flame retardant upholstery, fitted with a strong height–adjustable steel ladder back support for stability and to provide your clients with maximum comfort, comes with storage rack, towel rail and face hole feature for performing massage treatments. Direct Salon Supplies Aston Electric 3 Motor Three Section Couch comes with detachable armrests, converts easily from chair to couch, face hole with pillow/plug, remote control on leg rest and headrest. Lies completely flat and has outstanding adjustment and control. Exceptional stability, reliable and sturdy, rich foam padding, quality and style. Dimensions: Length 183cm, width 82cm with arm, 68cm without, Height 74-95cm. Can be delivered in two pieces and reasse. 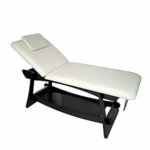 SK Flat Pack Heavy Duty Massage Couch, couch made in a box section heavy duty steel which is finished in high gloss white EPC and flame retardant upholstery, fitted with a strong height–adjustable steel ladder back support for stability and to provide your clients with maximum comfort, ideal for massage treatments with the couch being only 47.5cm in height, also comes with useful towel rail. Optional extras available on this couch, face plug, extra width 66cm, please ring 01270 630280 for more details. SK Deluxe Oval Heavy Duty Couch, couch made in double strength oval steel which is finished in high gloss white EPC and 3 inch shaped and stitched flame retardant upholstery, fitted with a strong height–adjustable steel ladder back support for stability and to provide your clients with maximum comfort, comes with towel rail and face hole feature for client comfort during treatments. 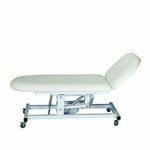 SK Medi Heavy Duty Treatment Couch, couch made in box section heavy duty steel which is finished in high gloss white EPC and 3 inch shaped and stitched flame retardant upholstery, fitted with a strong height–adjustable steel ladder back support for stability and to provide your clients with maximum comfort, comes with towel rail and face hole feature for client comfort during treatments, adjustable feet for uneven floors. SK Medi 3 Section Multi Purpose Treatment Couch with adjustable end section, couch made in box section heavy duty steel which is finished in high gloss white EPC and 3 inch shaped and stitched flame retardant upholstery, fitted with a strong height–adjustable steel ladder back support for stability and to provide your clients with maximum comfort, comes with towel rail and face hole feature for client comfort during treatments, adjustable feet for uneven floors. 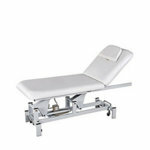 SK 2 Section Hydraulic Treatment Couch, hydraulic couch made in square and tubular heavy duty steel with 4 steel corner supports for extra stability which is finished in high gloss white EPC and 3 inch shaped and stitched flame retardant upholstery, comes with towel rail and face hole and plug feature for client comfort during treatments, adjustable feet for uneven floors. Optional extras available on this couch, face plug, extra width 66cm, lockable wheels, 2 colour upholstery please ring 01270 630280 for more details. 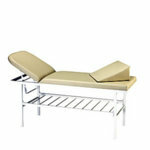 SK 3 Section Hydraulic Couch, hydraulic couch made in heavy duty steel finished in high quality chromium plate and 3 inch shaped and stitched flame retardant upholstery, adjustable arm rest comes with manual foot and head end adjustment feature for client comfort during treatments, adjustable feet for uneven floors. Optional extras available on this couch, 2 colour upholstery please ring 01270 630280 for more details. 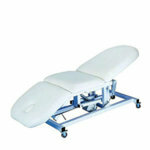 SK 2 Section Electric Treatment Couch, electric 2 section couch made in heavy duty steel construction finished in high quality gloss white EPC and 3 inch shaped and stitched flame retardant upholstery, electric height adjustment via hand held remote control for extra client comfort during treatments, breather hole with face plug, towel rail and steel ladder back support. Optional extras available on this couch, extra width 66cm, lockable wheels, adjustable arm rests and 2 colour upholstery also 3 inch deluxe deep upholstery please ring 01270 630280 for more details. Optional extras available on this couch, extra width 66cm, lockable wheels, adjustable arm rests (as shown in image) and 2 colour upholstery please ring 01270 630280 for more details. Optional extras available on this couch, extra width 66cm, extended head section with pillow, lockable wheels, adjustable arm rests and 2 colour upholstery please ring 01270 630280 for more details. Long half round pillow with a soft and comfortable cushioning. Sizes: Length 64cm, Height 15cm, Depth 9cm. Short half round pillow with a soft and comfortable cushioning. Sizes: Length 33cm, Height 15cm, Depth 9cm. 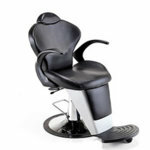 Direct Salon Supplies Somerset multi-purpose beauty chair/couch bed with hydraulic pump, adjustable head and foot, extra comfortable seat with face hole and removable head rest, The Somerset also has removable arms so bed can lay completely flat. Height 59-80cm, Length 186cm, Width 62cm. Available in white or black, please use the drop down box to choose your colour. 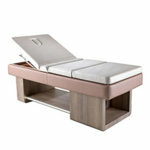 Vismara Antias Massage Beauty Bed, stylish beauty bed made in Italy from Finnish birchen water resistant wood, polishing treatment with ecological finishing, comes with comfy shaped mattress with facial opening with cap, covered with white leather skay, adjustable backrest, roll holder and shelf for towels or tools. Available in bleached maple, light walnut or dark wenge(please use the drop down box to choose your colour). Please allow 14 to 21 days for delivery. Dimensions height 770mm, length 1850mm and width 710mm. 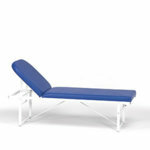 Vismara Sayuri Chaise Lounge, stylish spa couch with extractable footrest. Made from birch plywood in wenge or bleached maple with dark brown mattress. 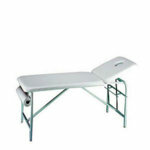 Dimensions Length 1300mm, length with footrest out 1530mm, width 540mm, height 750mm. 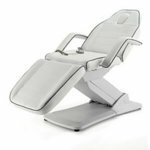 Skinmate Convertible Chair To Couch, a popular couch which can be easily positioned as a flat beauty salon couch or a beauty salon chair for facials at two heights either at 65cm or 75cm height by way of the height adjust triangle, head down tilt is also possible by raising one end. Both the foot and headrest are angle adjustable with the headrest having a breather hole and plug/head cushion, the arms are detachable or flatten out automatically with the couch, deep comfort white upholstered with a fully chromed steel sub-frame. Dimensions 185cm length 60cm width and 65-75cm height. The Elite is a fully automated 4 motor couch which has been ergonomically designed encompassing every beauty treatment from facials to pedicure, it has a functional design providing the performance you expect for treatment success, allowing access from every angle, infinitely adjustable to ensure that therapist stature is not compromised and correct working posture is always guaranteed, the simple elegance of the contoured cushions give a greater work surface and increased client comfort. Articulating, infinitely adjustable backrest for maximum comfort and access, finished with 7.5cm deep luxury upholstery. Tilt adjustment for comfortable knees up positioning. 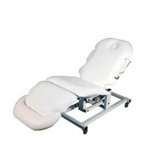 Twin headrest features, one that is long and rounded, used for the chair position, massage and body treatments. The other is short and contoured for facial work and specialised procedures. Small base frame foot print will give maximum leg and knee room with the additional benefit of remaining exceptionally sturdy and stable without losing flexibility. Effortless, silent lift height adjustment that descends low enough for wheelchair transfer. A superior performance couch that gives universal flexibility. Abrasion resistant upholstery that is hard wearing, also providing the benefit of low surface friction. Unique foldaway, reversible armrests, that become part of the upholstery when not in use. 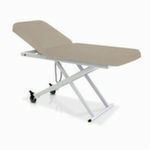 Vertical action footrest that moves freely into the frame, to allow the use of foot spas and Pedinett trays. The couch is finished with a durable, powder coated, scratch proof frame with locking castors for ease of movement. The couch is available in a choice of colours, white, black, beige, grey, navy or blue(please use the drop down box to choose your colour. A British Made couch offering dependable performance, please note each couch is specially made to order so please ring 01270 630280 for delivery times (approx 2 - 6 weeks). Dimensions length 185cm, width 63cm and height 58cm to 95cm. Skinmate Electric Three Section Beauty Couch, this versatile three section couch has adjustable headrests at both ends, one is long 89cm and has a curved end while the other is shorter 60cm and is square, the shorter headrest has the breather hole and can be raised to +55° or lowered to -45°. This very versatile couch will adapt to your every need and give your customer great comfort. Fitted with recovery foam upholstery and also locking wheels fitted as standard. The couch is available in a choice of colours, white, black, beige, grey, navy or blue(please use the drop down box to choose your colour. A British made couch offering dependable performance and comfort, please note each couch is specially made to order so please ring 01270 630280 for delivery times (approx 2 - 6 weeks). Dimensions length 212cm, width 70cm and height 58cm to 95cm. Skinmate Electric Concept Couch, the Concept Couch is designed for specific needs and treatment techniques, with its electric height adjustment and gas strut assisted cushion adjustment from a flat couch to full chair position. 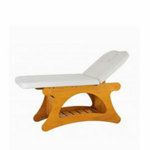 Its fully articulating, vertical movement footrest cushion that is ideal for pedicures. Open ended frame design to permit total therapist access. Contoured cushions that provide optimum comfort and client support, with a generous 70cm width and 7.5cm deep recovery foam upholstery which offers superior comfort for your customer, also locking wheels fitted as standard. The couch is available in a choice of colours, white, black, beige, grey, navy or blue(please use the drop down box to choose your colour. Dimensions length 200cm, width 70cm and height 60cm to 95cm. 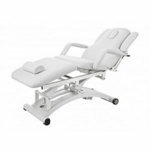 Skinmate Electric Couch With Knees Up Facility, a great British made couch to enhance your beauty treatments with this 3 section couch featuring a knees-up facility, to provide the ultimate client comfort. Fitted with recovery foam upholstery and unique touch gas lift assisted headrest adjustment. also locking wheels fitted as standard. The couch is available in a choice of colours, white, black, beige, grey, navy or blue(please use the drop down box to choose your colour. Skinmate 2 Section Electric Couch, a two section electric couch which is height adjustable and features a unique touch gas lift assisted positive or negative headrest, with a generous 70cm width and 7.5cm deep recovery foam upholstery which offers superior comfort for your customer, also locking wheels fitted as standard. The couch is available in a choice of colours, white, black, beige, grey, navy or blue(please use the drop down box to choose your colour. Dimensions length 186cm, width 70cm and height 58cm to 95cm. Skinmate Simplex Salon Beauty Couch, The Simplex has everything, white upholstered top, rising headrest with twin headrest stays for additional stability, breather hole, paper roll holder, scratch resistant frame. As your clients are getting taller, the couch is slightly longer than usual and is ideal for heavy massage. The Simplex is a British made product. Dimensions length 186cm, width 60cm and height 75cm. Please note bed roll is not included. 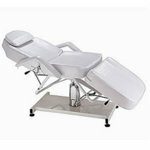 Direct Salon Supplies Fully Adjustable Couch with Four Motors, Suitable For All Treatments. Tilt Function with adjustable head, foot, height and arms. 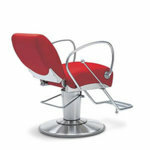 Direct Salon Supplies Centurian 2 Section Chrome Hydraulic Couch. 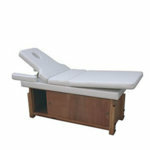 A great heavy massage couch that stays rigid, perfect for massages. Solid 2 section heavy duty treatment couch. Hydraulic height adjustment. Manufactured in square and tubular heavy duty steel. 4 steel corner supports for extra stability. Finished in a high gloss white EPC. Towel rail, face hole and face plug are all included. Adjustable feet for uneven floors. 3" shaped and stitched flame retardant upholstery. Dimensions: Length 72 inches (183cm), Width 24 inches(61cm), Height 26 to 30 inches (66cm-84cm). Available with white base or chrome base chrome base(please use the drop down box to choose). Please allow 4 weeks for delivery for chrome base Centurian. 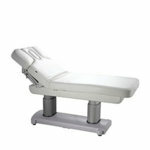 Direct Salon Supplies Warwick Examination Couch. Height 69 cms, width 62 cms,length 1.86 metres. With face hole and detachable bung pillow. Steel chrome and white powder coated. 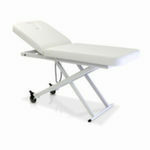 Weight 35 kg.Ideal for heavy duty massage. 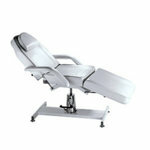 Available in White or Black upholstery please use the drop down box to choose your colour. 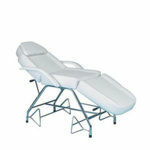 Direct Salon Supplies Wide beauty Bed with adjustable height and face cradle. Wide 30" width. 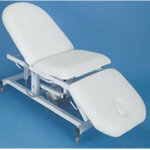 Skinmate Twin Hydraulic Treatment Couch, a heavy duty treatment couch with two hydraulics which when pumped provide a height adjustment of 65cm to 85cm angle and tilt, fully adjustable articulating backrest with breather hole and plug as in picture, backrest does not go beyond horizontal negative. Sizes length 187cm, width 63cm, height 65-85cm. Skinmate Height Adjustable Spa Couch, a height adjustable rustic wooden spa couch, from 64cm to 82cm, lightwood frame with large storage cupboard, comes with twin adjustable backrests, one long, and one short with breather hole and also armrest cushions. Dimensions length 185cm, width 64cm, height 64-82cm. the elite spa couch is a sophisticated and crafted, natural oakwood grained looking frame with a contrasting, contoured edge. Matching leather-look, grained vinyl with thick 7cm upholstery. Integrated storage shelf with complimentary image styled paper roll holder and adjustable rising headrest with breather hole and plug. Dimesions 198cm length, 70cm width and 76cm high. its a two section with manual head adjustment and white quilted upholstery and breather hole. Dimensions 192cm length, 78cm height and 72cm width. 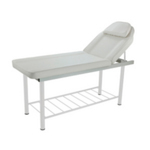 Direct Salon Supplies Static Wood Spa Couch, white upholstered wooden based spa couch with towel storage underneath and paper towel holder on the front with gas lift backrest. 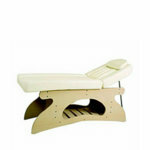 a spa couch which has been designed to enhance the well-being image of a spa or beauty salon. The shaped wooden curved base houses a spacious storage shelf for towels or products. The shape retaining upholstery which is in white provides the perfect balance to co-ordinate support and comfort. 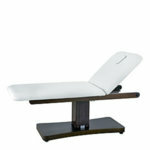 The adjustable back rest features twin support stays for extra stability and a breather hole for face down massage. Dimensions 183cm length 60cm width and 75cm height. 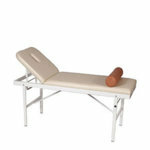 Direct Salon Supplies Physio/Medical Couch, medical couch with face hole removable arms and paper towel holder.